99 is a fun, easy-to-learn card game that can be enjoyed by 2 or more players. Avoid causing the count to go over 99 to win this game! The video tutorial and explanation are below. 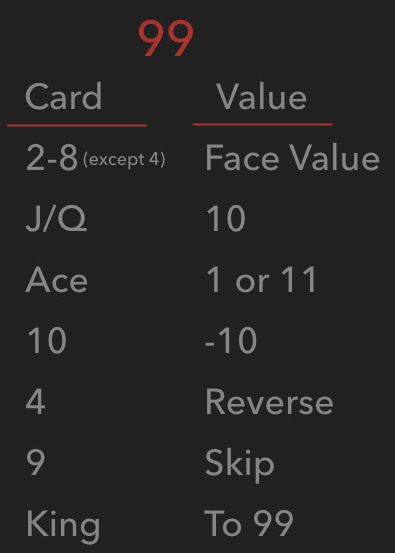 Objective: The object of the game is to avoid playing a card into the middle that causes the running total to exceed 99. Each player starts with three items, such as quarters, and the player that goes over 99 loses one of his/her 3 items. Deal: Each player is dealt 3 cards, one card at a time. The remaining deck is placed in the middle. Game Play: Cards are played into the middle and a running total of their value is kept. As a player plays a card, he/she will announce the new running total. Once a player plays a card, a new card is drawn from the remaining deck in the middle. Game End: The player that causes the running total to go over 99 loses the round. He/she will put 1 of his/her 3 items into the middle. A player that loses all 3 items is out of the game. The last player with an item left is the winner.